What About Spending a Few Nights in a Self-Catering Guest House in Graaff-Reinet? You may want to know what is so special about Graaff-Reinet that would make you spend a few nights there. The answer is that there are a lot of special things to enjoy in and around South Africa’s fourth oldest town. It is the oldest town in the Eastern Cape, and definitely the one with the most memorable ambience and atmospheric; Graaff-Reinet is the perfect stopover for anyone looking for a self-catering base from which to explore the majesty of the Karoo. It lies ensconced in a bend in the Sundays River, and sits in the shadow of the beautiful Sneeuberg mountains within the Camdeboo National Park. It is because of this, among many other reasons, that Graaff-Reinet remains a hit with tourists, nature aficionados, history buffs, and stargazers from all walks of life. With hundreds of buildings that have National Monument status, and a whole restored street, including its slave cottages, this town has managed to retain much of the character of a typical 19th century town over the years. There are many reasons why Graaff-Reinet is considered to be the gem of the Karoo. With a history that dates back hundreds of years, you will find much of South Africa’s history chronicled in its numerous museums, all of which receive thousands of inquisitive visitors throughout the year. Book your stay at a guest house offering self-catering accommodation in Graaff-Reinet, and you can be in charge of your own meals and catering while you enjoy your stay in this historical town. For many years, we have been welcoming travellers from across South Africa and the world, giving them shelter from the sweltering Karoo heat during summer, and the cold winter evenings. Our KarooRus guest house lies in the heart of Graaff-Reinet. It is an elegantly restored home featuring seven self-catering units. As one of the top guest houses offering self-catering accommodation in Graaff-Reinet, we welcome those who are just passing through town, or who are lingering for a while, for a luxurious, yet affordable stay. Let our luxury self-catering units provide you with a comfortable and safe base from which to explore the town and surrounding area. Look forward to game drives in the Camdeboo National Park, picnics along the Sundays River, and visiting the numerous award-winning restaurants, museums, and shops in and around Graaff-Reinet. But, after a long day of exploration and memories, you can return to your comfortable and modern guest house to recharge for the next adventure. We are ready to provide you with the luxurious accommodation experience you have come to expect, with a modern kitchenette and appliances, satellite television, en-suite bathrooms, and quality bedding and linen. These are only a few of the many things you can look forward to when booking your stay with us. Contact us to discuss your accommodation needs, and let us help you make your stay in Graaff-Reinet even more unforgettable. Our reservationists are awaiting your call, and will help you to book your stay on your preferred dates. There are so many reasons to visit Graaff-Reinet. You will probably have a full itinerary when you book your trip, but you will definitely need affordable and fully equipped self-catering units when visiting South Africa’s fourth largest town as well. Graaff-Reinet is often referred to as the heart of the Great Karoo, and with good reason. It is flanked by the Camdeboo National Park in the Eastern Cape, which is reason enough for many nature lovers to visit the town. With a history dating back to the 1780s, Graaff-Reinet continues to draw local and foreign visitors to the area for its vast natural beauty, historical significance, and isolated Karoo charm. You do not need to look any further than the Sneeuberg mountains, which keeps watch over this enduring 19th century-style countryside town where it seems that time is standing still. Graaff-Reinet lies in the horseshoe bend of the Sundays River, and boasts more than 200 national monuments – more than any other town in South Africa. What Can You Do When Visiting Graaff-Reinet? When you book your stay at the fully equipped self-catering units at our guest house in Graaff-Reinet, you can look forward to retiring to comfortable accommodation after a long day of exploring throughout Graaff-Reinet and its surrounds. Some of the many activities you can try during your stay include picnicking and game driving through the Camdeboo National Park, or visiting the spectacularly beautiful Valley of Desolation. Visit any of the celebrated museums, and enjoy dining at the many fine, award-winning restaurants in town. 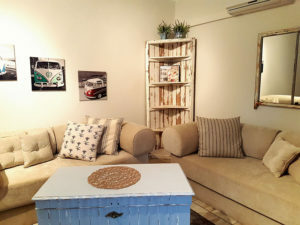 Shop at charming curio shops and take in the sights and sounds of Karoo life. Other fun activities include microlight flying, horse-riding, mountain biking, and guided township walks. These are only a few of the many exciting activities and attractions you can look forward to when booking your stay at our fully equipped self-catering units in Graaff-Reinet. If you are looking for luxurious and fully equipped self-catering units during your stay in Graaff-Reinet, then you have found them. Our lovely old house was recently renovated, and consists of seven self-catering units, each offering its own private entrance and stylishly decorated interior, ready to welcome you and your family for the duration of your stay. We welcome many travellers from all across South Africa and the world who are in search of an authentic Karoo experience. Each of our units have top-quality linen and bedding, along with a fully equipped, modern kitchenette, satellite television channels, and beautiful wooden floors. Look forward to a warm bath in your en-suite bathroom as you regroup for another day of adventure and memory-making. 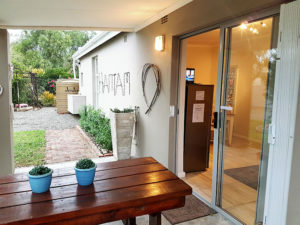 Our fully equipped self-catering units are situated centrally in Graaff-Reinet, and are within walking distance of excellent and award-winning restaurants. Contact us to learn more about our company, and for all the information you need to make an informed decision as to where to book your stay when visiting Graaff-Reinet. We look forward to welcoming you and making your stay as comfortable and memorable as possible.